We are delighted to confirm the appointment of Gary Locke as Manager of Raith Rovers FC with immediate effect. Gary joins us on a two year contract, and he was formally unveiled at a Press Conference at Stark’s Park this afternoon. 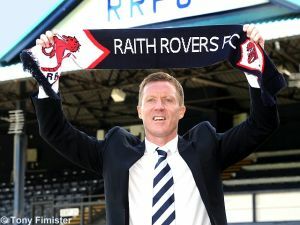 An interview with the new gaffer will appear on Raith TV later today. Gary is a UEFA Pro licensed coach and has more than 25 years experience in top flight football as a player, coach and manager. After a successful playing career as captain with Hearts and Kilmarnock and a spell in the English Premier League with Bradford City, his coaching career started with Kilmarnock back in 2008, before he was identified for a first team coaching role with Hearts. It was there he assisted Paolo Sergio as Hearts won the Scottish Cup in 2012. Gary was then promoted to Hearts’ first team manager in 2013 operating under very difficult circumstances when the club entered into Administration and were subsequently deducted 15 points sealing their relegation. Gary left Hearts for a new challenge in 2014 and returned to former club Kilmarnock as assistant to Allan Johnston, before replacing him as first team manager in 2015. More news will follow later today.